Click Here. Double your traffic. Get Vendio Gallery Now FREE! 3LZ Package ($8,650 factory option) Navigation Back Up Camera Heated/Cooled Seats Power Convertible Top Yellow Brake Calipers Heads Up Display Bose Premium Sound AM FM Sat Radio Bluetooth USB iPod Connect Dual Power Seats Dual Climate Control Factory Black Z06 Wheels (tires have plenty of tread all around) Keyless Start Remote Start Remote Power Top Auto Climate Control Cruise Control Power windows Power mirrors Power Locks Etc.... $97,255.00 Original MSRP The car is finished in beautiful "Black" and looks stunning. The body is straight as an arrow and free of any damage. This car has beautiful color combo and looks amazing with its black wheels, and kalahari interior. This Corvette features factory black painted wheels to give it that ultra aggressive stance all wheels and tires are all in excellent condition and have plenty of tread all the way around. CAR IS MINT IN THE WRAPPER LIKE NEW! Clean carfax and autocheck history reports no accidents. The beautiful kalahari leather interior is all stock and looks like new. The car has the 3LZ preferred package that also has AM FM CD SAT radio upgraded Bose premium sound, heads up display, navigation and much more. keys, books, original window sticker, and mats. NON SMOKER VERY CLEAN INTERIOR Mechanically, this Vette is in excellent condition and runs and drives very nice. It has very healthy eight cylinder motor that is very strong and eight speed automatic transmission that shifts nice and smooth. 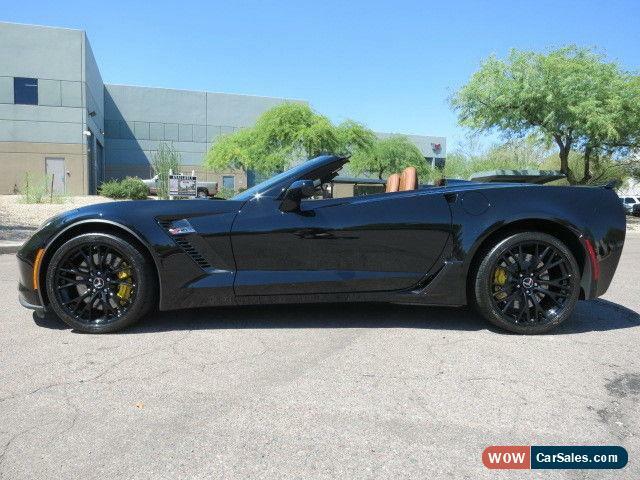 This Corvette features that all important LT4 6.2L 650hp supercharged V8 that makes this car the beast it is. The sound that this Corvette produces is unreal and is truly intoxicating. 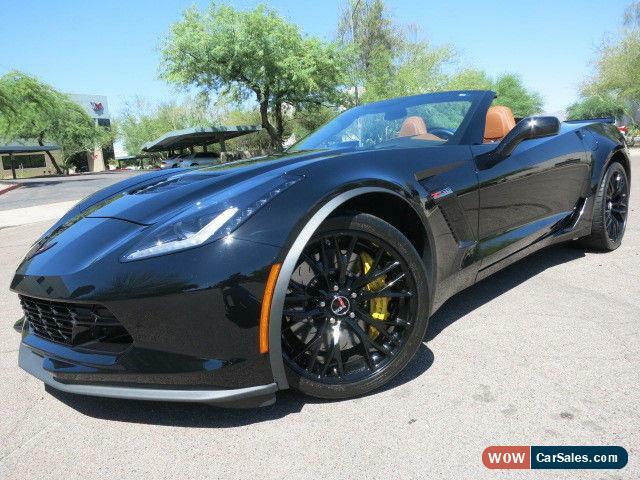 One drive in this Corvette and you will be SOLD! 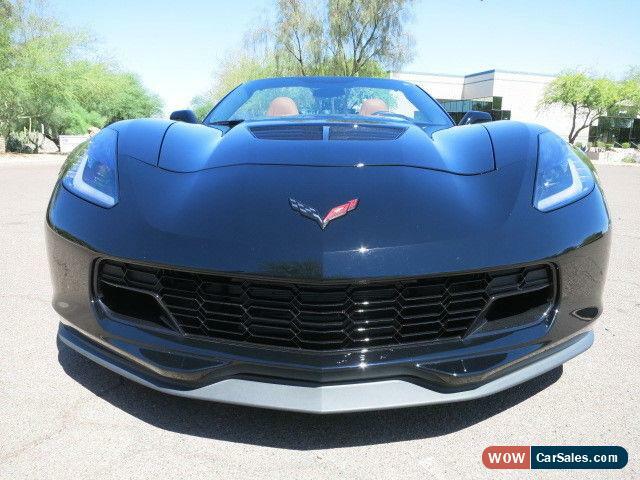 This Corvette Z06 convertible is ready to hit the street and look good doing it! This car is in excellent condition inside and out and is sure to please its next owner. Now is your chance to get it that Corvette you always dreamed of at fraction of its original cost. If you have any additional questions please call Joey Cascio at 480-205-5880. The car is located in beautiful sunny Scottsdale, AZ. Please email or call with any questions and welcome international bidders! can also help with shipping quotes and arrangements. We ship cars all over the world! We have lenders we work with that can get you financed, please call or email if you are interested. With almost 98% of my cars sold sight unseen have reputation for delivering the highest quality cars available on the market. Bid with confidence and check out my excellent 100% positive feedback rating! Good luck in the bidding! Please allow for the 100+ high quality pictures to load! Buy With Confidence! Terms and Conditions of Sale We take time to carefully describe each vehicle and include substantial number of photos. However, it is very important to keep in mind that these vehicles are pre-owned, not brand new. After careful reading of the entire description, rather than making potentially incorrect assumption, if any statement or comment is unclear, or if you have questions, please e-mail or call us prior to bidding. We are licensed and bonded automotive dealership based in Phoenix, Arizona. Buying through licensed dealer gives you as consumer certain rights, and ensures your protection from title fraud and other problems encountered in private party automotive transactions. In addition, you may also qualify for lower interest rates by purchasing through dealership. We reserve the right to sell this vehicle locally prior to the end of any advertisement or listing. We also reserve the right to refuse service to anyone for any reason. Cars are demonstrated and/or test-driven on daily basis and therefore may have more mileage upon delivery than indicated in original listings. All transactions are subject to Document/Preparation fee of $295. Arizona residents will be responsible for 7.95% sales tax, and vehicle registration costs. Non-Arizona residents wishing to pick up their vehicle from our dealership in Phoenix will be responsible for paying sales tax in Arizona. Tax will not be charged if the vehicle is shipped out of state. Any out-of-state residents wishing to drive their new vehicle prior to registering it in their home states will be provided 90-day non-resident temporary permit. All taxes and license fees will need to be paid by the buyer when the vehicle is registered in their home state. All state taxes and motor vehicle-related fees are administered by each state individually, are not included in the price of the vehicle, and are non-negotiable. Most vehicle titles are not held on the premises and it may take up to 30 days to receive one. Due to the fact that we often have multiple prospective buyers for the same vehicle, we will not "hold" vehicle without signed non-refundable deposit, signed purchase order, and signed General Information and Terms of Sale form. Without this deposit, all vehicles will remain advertised, listed, and available for sale. Although we make every attempt to deliver our vehicles with full set of keys, key fobs, books, floor mats, manuals, etc., we cannot guarantee that pre-owned vehicle will have all of these items. Most of them can be ordered at minimum cost in addition to the price of the vehicle, if you desire to do so. The substantial reduction in price between new and pre-owned vehicles reflects in part the chance that these items might be missing. At Close of Auction The successful "winning" bidder must telephone us within 24 hours after the auction has ended to verify purchase and make arrangements to complete the transaction. Full payment must be received within business days of the end of auction. Payment must be either by cashiers-check, or certified funds. If funds are not received, and an alternate arrangement has not been made, the vehicle can and will be made available to other potential buyers on first-come, first-serve basis. The parties agree that this contract shall be construed under the substantive laws of the state of Arizona, that the state courts of Arizona shall have exclusive jurisdiction over any action brought to enforce the terms of this contract or over any action arising out of the underlying transaction(s) with seller and venue may be had in the Maricopa county superior court of the state of Arizona. Our Guarantee We have disclosed as much information as possible about this vehicle and aim to only carry quality vehicles. However, we recommend that all buyers conduct an inspection either in person or through qualified professional third party inspector prior to the end of the auction. If such inspection reveals substantial discrepancy between the information contained in the listing and the actual vehicle, we will correct the problem at no charge or work out compromise. Shipping We value your business and want you to be completely satisfied with your Ebay buying experience, from purchase to delivery. As value added service we will assist with shipping arrangements however, the buyer pays all shipping costs. We do not have any affiliation with, or interest in, any transportation companies and all questions or concerns should be addressed directly with them. Disclaimer All vehicles are sold As Is, with no warranties expressed or implied, by seller. Vehicles come with books and/or manuals only if pictured in the included photos or if stated in the ad. As with any used vehicle, minor signs of wear may become more obvious under close inspection, such small chips or nicks, light scratches or minor abrasions, wheel scuffs, and other indications of normal wear and tear. We will not and cannot be held liable or responsible for these issues. Bidders are entering into legal and binding contract to purchase the vehicle described above. If you do not intend to purchase this item, DO NOT BID! PLACING BID ON THIS AUCTION, CONSTITUTES ACCEPTANCE OF THESE TERMS AND CONDITIONS AND ACKNOWLEDGEMENT THAT YOU HAVE READ AND UNDERSTAND ALL THE INFORMATION PRESENTED.